Give four decadent caramel apple favorites in one delicious gift. Each begins with a tart Granny Smith apple dipped in creamy caramel. The first is iced with white confection then covered with cinnamon. The second is layered with honey roasted peanuts and drizzled with milk chocolate. The third is a swirled blend of white confection with milk and dark chocolate. The fourth is enrobed in pecans and milk chocolate drizzle. They’re an outstanding treat in every way. Measures 8”H x 7.5”W x 7.5”L Arrives as pictured tied with a bow. This gift is exceptionally fresh and requires overnight delivery. 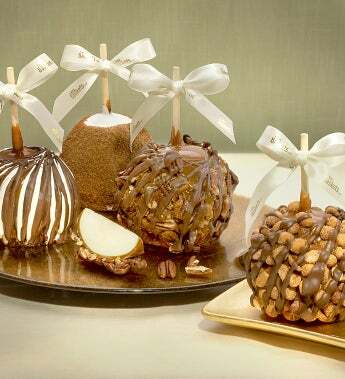 Give four decadent caramel apple favorites in one delicious gift. Each begins with a tart Granny Smith apple dipped in creamy caramel.